In our First Lesson of this series we spoke of the One Reality underlying all Life. This One Reality was stated to be higher than mind or matter, the nearest term that can be applied to it being “Spirit.” We told you that it was impossible to explain just what “Spirit” is, for we have nothing else with which to compare or describe it, and it can be expressed only in its own terms, and not in the terms applicable to its emanations or manifestations. But, as we said in our First Lesson, we may think of “Spirit” as meaning the “essence” of Life and Being–the Reality underlying Universal Life, and from which the latter emanates. In the Second Lesson we stated that this “Spirit,” which we called “The Absolute,” expressed itself in the Universal Life, which Universal Life manifested itself in countless forms of life and activity. In the same lesson we showed you that the Universe is alive–that there is not a single dead thing in it–that there can be no such thing as a dead object in the Universe, else the theory and truth of the One underlying Life must fall and be rejected. In that lesson we also showed you that even in the world of inorganic things there was ever manifest life–in every atom and particle of inorganic matter there is the universal life energy manifesting itself, and in constant activity. In the Third Lesson, we went still further into this phase of the general subject, and showed you that the Creative Will–that active principle of the Universal Life–was ever at work, building up new forms, shapes and combinations, and then tearing them down for the purpose of rebuilding the material into new forms, shapes, and combinations. The Creative Will is ever at work in its threefold function of creating, preserving and destroying forms–the change, however, being merely in the shape and form or combination, the real substance remaining unchanged in its inner aspect, notwithstanding the countless apparent changes in its objective forms. Like the great ocean the depths of which remain calm and undisturbed, and the real nature of which is unchanged in spite of the waves, and billows of surface manifestation, so does the great ocean of the Universal Life remain unchanged and unaltered in spite of the constant play of the Creative Will upon the surface. In the same lesson we gave you many examples of the Will in action–of its wondrous workings in the various forms of life and activity–all of which went to show you that the One Power was at work everywhere and at all times. In our next lesson–the Fifth Lesson–we shall endeavor to make plain to you the highest teachings of the Yogi Philosophy regarding the One Reality and the Many Manifestations–the One and the Many–how the One apparently becomes Many–that great question and problem which lies at the bottom of the well of truth. In that lesson we shall present for your consideration some fundamental and startling truths, but before we reach that point in our teachings, we must fasten upon your mind the basic truth that all the various manifestations of Life that we see on all hands in the Universe are but forms of manifestation of One Universal Life which is itself an emanation of the Absolute. Speaking generally, we would say to you that the emanation of the Absolute is in the form of a grand manifestation of One Universal Life, in which the various apparent separate forms of Life are but centers of Energy or Consciousness, the separation being more apparent than real, there being a bond of unity and connection underlying all the apparently separated forms. 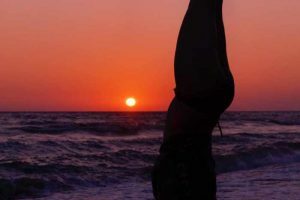 Unless the student gets this idea firmly fixed in his mind and consciousness, he will find it difficult to grasp the higher truths of the Yogi Philosophy. That all Life is One, at the last,–that all forms of manifestation of Life are in harmonious Unity, underlying–is one of the great basic truths of the Yogi Teaching, and all the students of that philosophy must make this basic truth their own before they may progress further. This grasping of the truth is more than a mere matter of intellectual conception, for the intellect reports that all forms of Life are separate and distinct from each other, and that there can be no unity amidst such diversity. But from the higher parts of the mind comes the message of an underlying Unity, in spite of all apparent diversity, and if one will meditate upon this idea he will soon begin to realize the truth, and will feel that he, himself, is but a center of consciousness in a great ocean of Life–that he and all other centers are connected by countless spiritual and mental filaments–and that all emerge from the One. He will find that the illusion of separateness is but “a working fiction of the Universe,” as one writer has so aptly described it–and that All is One, at the last, and underlying all is One. Some of our students may feel that we are taking too long a path to lead up to the great basic truths of our philosophy, but we who have traveled The Path, and know its rocky places and its sharp turns, feel justified in insisting that the student be led to the truth gradually and surely, instead of attempting to make short cuts across dangerous ravines and canyons. We must insist upon presenting our teachings in our own way–for this way has been tested and found good. We know that every student will come to realize that our plan is a wise one, and that he will thank us for giving him this gradual and easy approach to the wondrous and awful truth which is before us. By this gradual process, the mind becomes accustomed to the line of thought and the underlying principles, and also gradually discards wornout mental sheaths which have served their purposes, and which must be discarded because they begin to weigh heavily upon the mind as it reaches the higher altitudes of The Path of Attainment. Therefore, we must ask you to consider with us, in this lesson, some further teachings regarding the Unity of Life. All the schools of the higher Oriental thought, as well as many of the great philosophical minds of the Western world, have agreed upon the conception of the Unity of Life–the Oneness of All Life. The Western thinkers, and many of the Eastern philosophers arrived at this conclusion by means of their Intellectual powers, greatly heightened and stimulated by concentration and meditation, which latter process liberated the faculties of the Spiritual Mind so that it passed down knowledge to the Intellect, which then seized upon the higher knowledge which it found within itself, and amplified and theorized upon the same. But among the Eastern Masters there are other sources of information open, and from these sources come the same report–the Oneness and Unity of Universal Life. These higher sources of information to which we have alluded, consist of the knowledge coming from those Beings who have passed on to higher planes of Life than ours, and whose awakened spiritual faculties and senses enable them to see things quite plainly which are quite dark to us. And from these sources, also, comes the message of the Oneness of Life–of the existence of a wonderful Universal Life including all forms of life as we know it, and many forms and phases unknown to us–many centers in the great Ocean of Life. No matter how high the source of inquiry, the answer is the same–“All Life is One.” And this One Life includes Beings as much higher than ourselves, as we are higher than the creatures in the slime of the ocean-bed. Included in it are beings who would seem as archangels or gods to us, and they inform that beyond them are still higher and more radiant creatures, and so on to infinity of infinities. And yet all are but centers of Being in the One Life–all but a part of the great Universal Life, which itself is but an emanation of The Absolute. The mind of man shrinks back appalled from the contemplation of such wonders, and yet there are men who dare to attempt to speak authoritatively of the attributes and qualities of “God,” as if He, the Absolute, were but a magnified man. Verily, indeed, “fools rush in where angels fear to tread,” as the poet hath said.